When connecting to QuickBooks Online, occasionally users may see ‘We’re experiencing some problems, the application has already been subscribed to by another user for this company’ message. 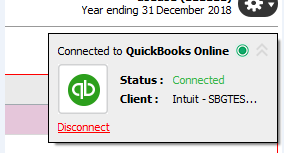 This error occurs if a QuickBooks Online user has previously connected to QuickBooks Online and the client file is still connected to the last person that performed the import/logged into QuickBooks Online. QuickBooks Online can only connect one user per company at any given time, this is a restriction in QuickBooks Online and in order to connect to the same client by a different user, you must disconnect TaxCalc Accounts Production for the affected company within QuickBooks Online. How to disconnect TaxCalc Accounts Production App? In the top right hand corner of Accounts Production, there will be a drop down menu for Connected to QuickBooks Online. From here, you will see the option to Disconnect.